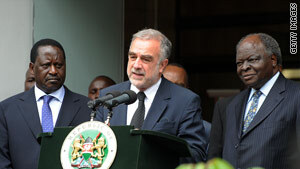 ICC prosecutor Luis Moreno-Ocampo is flanked by Kenya President Mwai Kibaki, right, and Prime Minister Raila Odinga. Nairobi, Kenya (CNN) -- The top prosecutor of the International Criminal Court arrived in Kenya on Saturday to investigate post-election violence that left more than 1,000 people dead more than two years ago. Hundreds of thousands were also displaced after the disputed December 2007 election sparked ethnic violence nationwide. Prosecutor Luis Moreno-Ocampo said his five-day trip will include visits with victims. He'll also tour some of the areas hardest hit by the violence, including Rift Valley province and the sprawling Kibera slum in Nairobi. Ocampo said he'll also meet top government officials and those who believe they were unfairly identified as suspects on a list of 20 people handed to him. The names of the suspects have not been identified publicly. Chaos erupted after incumbent President Mwai Kibaki was declared the winner in the election. Opposition challenger Raila Odinga decried the results, prompting violence between their supporters. The election and its aftermath tainted the country's image as an oasis of stability in the region. Former United Nations chief Kofi Annan and other world leaders intervened, and the two contenders signed a power-sharing agreement. Kibaki is the president while Odinga is the prime minister. Annan has said proceedings against culprits should occur before campaigning starts for the next election in 2012.